پورکرمانی, کسری. (1397). مدل‌سازی مالی و تجزیه‌وتحلیل لایروبی بنادر. پژوهشنامه حمل و نقل, 15(4), 165-174. کسری پورکرمانی. "مدل‌سازی مالی و تجزیه‌وتحلیل لایروبی بنادر". پژوهشنامه حمل و نقل, 15, 4, 1397, 165-174. پورکرمانی, کسری. (1397). 'مدل‌سازی مالی و تجزیه‌وتحلیل لایروبی بنادر', پژوهشنامه حمل و نقل, 15(4), pp. 165-174. پورکرمانی, کسری. مدل‌سازی مالی و تجزیه‌وتحلیل لایروبی بنادر. 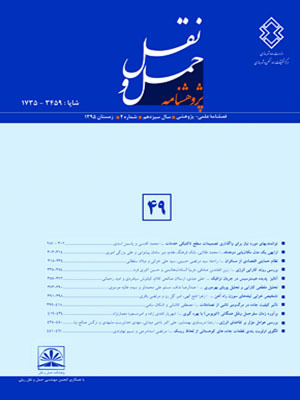 پژوهشنامه حمل و نقل, 1397; 15(4): 165-174. هدف از پژوهش حاضر، مدیریت لایروبی رسوبات، برای بسیاری از بندرها و بندرگاه‌هایی است که به حفظ قابلیت دسترسی کشتی، نیاز دارند. حجم رسوبات تولید شده، ممکن است برای مدیریت قابل‌توجه و هزینه‌بر باشد. در این مقاله، با استفاده از یک مدل مالی (که می‌تواند به‌عنوان یک ابزار پشتیبان تصمیم‌گیری توسط سهامداران در بخش‌هایی از جمله بنادر، شرکت‌های مشاوره مهندسی و ناظران مورد استفاده قرار گیرد)، مدل‌سازی و تجزیه‌وتحلیل مالی برای مدیریت لایروبی رسوبات دریایی توسعه داده شده است. برای انجام این پژوهش، یک ابزار پشتیبان تصمیم‌گیری، جهت ارزیابی جنبه مالی طیف وسیعی از کاربردهای مدیریتی لایروبی رسوبات دریایی و در گستره وسیعی از کشورهای مختلف، ایجاد شده است. این مدل، به تجزیه‌وتحلیل مالی طیف گسترده‌ای از فرایندهای تولیدی لایروبی تا استفاده نهایی می‌پردازد. ورودی‌های موردنیاز، شامل ویژگی‌های رسوب، داده‌های مربوط به لجستیک و حوزه تأثیر مالی در مقیاس ملی است. اطلاعات مالی نیز شامل هزینه‌های مستقیم می‌باشد. نتایج به دست آمده، برای استفاده خاص در خصوص لایروبی رسوبات (ایجاد تالاب) ارائه شده است. مقالۀ حاضر، توان بالقوه ابزار پشتیبانی تصمیم‌گیری را برای ارزیابی مالی طیف وسیعی از گزینه‌های مدیریت لایروبی توضیح می‌دهد؛ همچنین اطلاعات ارزشمندی را برای مدیریت بهینه لایروبی رسوبات دریایی ارائه می‌دهد و امکان مقایسه بین گزینه‌های در دسترس سنتی و سناریوهای مفید بالقوه را فراهم می‌نماید. The purpose of this study is to analyse the financial aspects of dredging for ports and harbours that need to maintain ship accessibility. The volume of sediment produced is usually significant in size and in expenses to manage. This paper develops a financial modelling and analysis for the management of maritime sediments using a financial model. This model can be used as a decision-making support tool by shareholders in ports, consulting companies and observers. To achieve this, a decision support tool has been developed and almost every available data has been used from a wide range of different countries. This model analyses a wide range of dredging production processes until the final usage. Required inputs include sediment characteristics, logistics data, financial scale of dredging in national level and direct expenses. This paper explains the potential of the decision support tool for financially evaluating a wide variety of dredging management options, as well as providing valuable information for the optimal management, and provides a comparison between traditional options and potentially useful scenarios. -DTZ Sherry Fitzgerald, Dublin, Ireland Eisma D, (2006), “Dredging in coastal waters. Taylor & Francis plc, United Kingdom Environment Agency WRAP (2010), Technical report on the beneficial use of marine sediment from capital and maintenance dredging in land based projects. Oxfordshire, UK. -Fletcher JE, (1989), “Input-output analysis and tourism impact studies”. Ann Tour Res, 1989 16(4), pp.514–529. -Harrington J. Smith G, (2013), “Guidance on the beneficial use of dredge mate in Ireland”, report commissioned by the Irish Environmental Protection Agency. -Hawdon D. Pearson P, (1995), “Input-output simulations of energy, environment, economy interactions in the UK”. Energy Econ 17(1), pp.73–86. -Ivanova G, Rolfe J, (2011), “Using input-output analysis to estimate the impact of a coal industry expansion on regional and local economies, Impact Assessment and Project Appraisal”, Beech Tree Publishing 29, (4), pp.277–288. -Kaewkaorop P, (2007), “Stabilization of seabed dredged mate for landfill liners”. A thesis presented to Kasetsart University, Thailand. -Kammen DM, Wei M. Patadia S, (2010), “Putting renewables and energy efficiency to work: How many jobs can the clean energy industry generate in the US? Energy Policy 38(2): pp919–931. -Leontif, WW, (1951), “Input output economics”. Sci Am 185(4), pp.15–21. -PIANC, (1992), “Beneficial use of dredged mate”. EnviCom Working Group 19, Brussels. -PIANC (2009a), “Long term management of confined disposal facilities for dredged mate. EnviCom Working Group 11, Brussels. -PIANC, (2009b), “Best management practices applied to dredging and dredged mate disposal projects for protection of the environment”. EnviCom Working Group 13, Brussels. -PIANC (2009c), “Dredged mate as a resource - options and constraints”. EnviCom Working Group 14, Brussels. -Riordan J, Murphy JP, Harrington JR, (2008), “Construction and demolition waste and dredge mate as landfill liner in Ireland”, 1st Middle European Conference on Landfill Technology, The Hungarian Academy of Sciences, Budapest, February. -Romera M, (2007), “Sintering behavior of ceramic bodies from contaminated marine sediments. Group of Glassy and Ceramic Mates, Department of Building Construction Systems, Institute of Construction Sciences “Eduardo Torroja” CSIC, Madrid. -Sheehan C, (2012), “An analysis of dredge mate reuse techniques for Ireland”, Ph.D. Dissertation. Institute of Technology, Cork. -Sheehan C, Harrington J, Murphy JD, (2010), “An environmental and economic assessment of topsoil production from dredge mate”. J Resour, Conservat Recycl 55(2010), pp.209–220. -nited States Army Corps Engineers, (1987), “Beneficial uses of dredged mate”. EM 1110-2-5026, US Army Corps of Engineers, Washington, DC. -“United States Army Corps Engineers & United States Environmental Protection Agency”, (2007), Identifying, planning, and financing beneficial use projects using dredged mate: beneficial use planning manual. U.S. Environmental Protection Agency & U.S. Army Corps of Engineers, Washington, DC. -“United States Army Corps Engineers, Estes TJ, McGrath CJ, (2014), “Economical treatment of dredged mate to facilitate beneficial use”. Environmental Laboratory U.S. Army Engineer Research and Development Center, Vicksburg.